Basement flooding in Westchester NY? Looking for a waterproof solution? Did you have a flood in your basement ? Many low lying areas of Westchester, got hit hard from the Superstorm, including Rye, Scarsdale, Larchmont, Mamaroneck, New Rochelle and Bronxville. Some have had frozen pipes this winter, and still others have had broken water heaters. We’ve had a lot of customers calling due to drenched carpets. And, if you don’t remove them soon enough, they really start to smell…and if they sit too long they could develop that forbidden word…mold. Yuck! Sometimes, the water damage is covered by insurance, especially if it was due to an electrical failure. Usually, the insurance will compensate you for replacement value of what you had. We’ve had many customers in Westchester who were so disgusted by the smell and ordeal associated with flooded carpets, that sometimes, they just never want to go back to carpet. Instead, they would prefer a water proof solution. Please note that this article may contain affiliate links. You read my full disclosure at the bottom of the page. Types of flooring that are water proof or water resistant…good options for Westchester basements that tend to flood. 1. Tile flooring – Tile is probably the closest you can get to water proof flooring. It’s also generally the most expensive surface, but once it’s down, it basically stays put. So, if you don’t want to worry about redoing your floors after a flood, tile could be a good option, especially if your floor is level and smooth. If your floor isn’t level or smooth, you may want to consider an alternative to avoid spending a lot of money in floor prep. 2. Vinyl plank and tile (often called luxury vinyl) – This is incredibly durable and will usually survive any flood, especially if it’s adhered to the floor with a waterproof adhesive (as most are). Luxury vinyl, as the name implies, looks much nicer than sheet vinyl and costs more. Often it will cost a bit less than ceramic tile. If your basement is uneven, this is probably a much more cost efficient option vs. tile as less floor prep is needed. Do try to avoid the cheaper imitations that you find at Home Depot. Their adhesive is inferior and they tend to peel up after 6 months, and they certainly won’t survive a flood. Read more about luxury vinyl here: Can you believe it’s vinyl? 3. Rubber flooring – Gym flooring or rubber tile holds up extremely well to water. If you want the look of a gym, it’s a perfect option as it gives you some cushion for your feet. Many of the rubber tiles are interlocking. So, if you do have a flood, you can pick them up yourself and just let the water drain and then easily reconstruct afterwards. 4. Sheet vinyl – Sheet vinyl is water resistant. 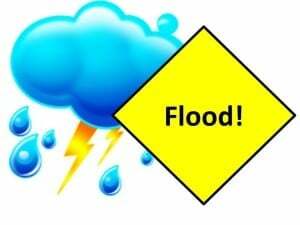 If you have a short flood or small amount of water, it will usually survive. If the water is sitting for too long, it could damage the adhesive and parts could come loose. 5. Linoleum – Many customers get linoleum confused w/ sheet vinyl. Linoleum comes in sheets, but it’s a green product that is more expensive than sheet vinyl. And, the rolls are usually only 6.5 ft wide so you may have a bunch of seams. If you are looking for a less expensive solution, try sheet vinyl; if going green is important to you, then consider linoleum. 6. Vinyl Composite Tile (VCT) – These are less expensive vinyl squares that are 12 x 12″. You often see them in schools, grocery stores or Chinese take-out restaurants. They often sort of look marbly and they come in many colors – and sometimes you can even make cool designs with these squares. These tiles are pretty water resistant too. It’s a more industrial look and feel…which is fine for some basements. 1. Carpet – Most carpet will not survive a flood. Sometimes, if you lift it up quick enough and remove all the carpet pad, this can be salvaged and then you just need a “pad and restretch.” While most carpet will not survive floods, it is the least expensive surface and it can tolerate uneven basements, so many opt to put carpet in the basement to save money – at least in the short run. 2. 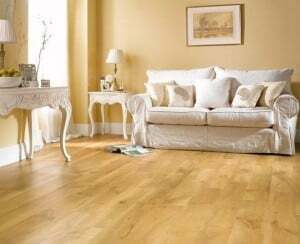 Laminate flooring – many get this mixed up with vinyl flooring. Laminate flooring is made w/ wood, so it is NOT waterproof. Often, basement flooring comes down to trade-offs. What is most important to you – the look and feel, the cost, how resistant it is to water? 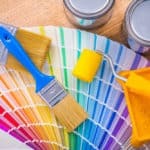 Often, these are in conflict, so you need to choose what is best for your basement and your budget. All basements are different. Some are flat and smooth (which makes any flooring work better); others are uneven, cracked and sloping. All these factors are important considerations. 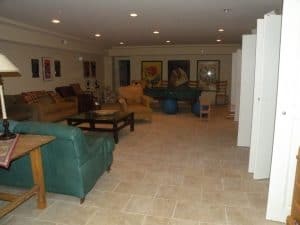 It’s often helpful to bring in an expert who can help find the best flooring solution for your basement. Basement flooding Westchester County NY? Looking for a water proof flooring solution? Hi Debbie, I grew up in Westchester and now work for FLOOR&DECOR in Atlanta as a Chief Executive Merchant. We would like to do some short term business with companies helping those affeceted by Sandy. Let me know what you think. Brilliant post for your area right now! Like people looking for homes with basements after tornadoes. Hopefully you will get a lot of great leads. Thank you so much, Theresa. Yes, unfortunately, I think there may be many that need help due to the storm. We are happy to help, if they would like our assistance/advice. Great information for those in your area. I’m sure you will get a lot of folks from insurance companies ready to remodel and rebuild. Mark – Thank you so much. I really hope this info helps people. Hurricane Sandy did a lot of damage, esoecially in NY, NJ and CT. Flooding is one of the catastrophe which anybody can face. If water is not removed from basement correctly it can cause structural damage to the house. I think after reading your blog readers will easily handle this problem. Yes, Tony it’s critical to remove water from basements. This can cause all sorts of issues from structural to mold/health issues. Thanks for your comment. Thank you so much, Debbie. Yes, unfortunately, I think there may be many that need help due to the storm. We are happy to help, if they would like our assistance/advice. Yes, there are a lot in the area looking to repair their homes after the storm. great article and great content and thanks for sharing. I like how you said “Most carpet will not survive a flood”. When my basement flooded I tried to save my carpet. I used five fans to dry it out, but the musty, moldy smell never left. It would have been better if I had just replaced it. Ian – Yes, usually it’s better to replace. At a minimum, you must remove the carpet padding.